Whether you’re new to email marketing or consider yourself an expert, you likely want the same: to send the best email marketing campaigns. But if you want higher opens, clicks, and conversions, you have to get your hands dirty and start optimizing your email campaigns. It’s the only way to beat the average email open and click-through rates over the long-term. If you’re just getting started, read our beginners guide to email marketing first. Already know your way around? 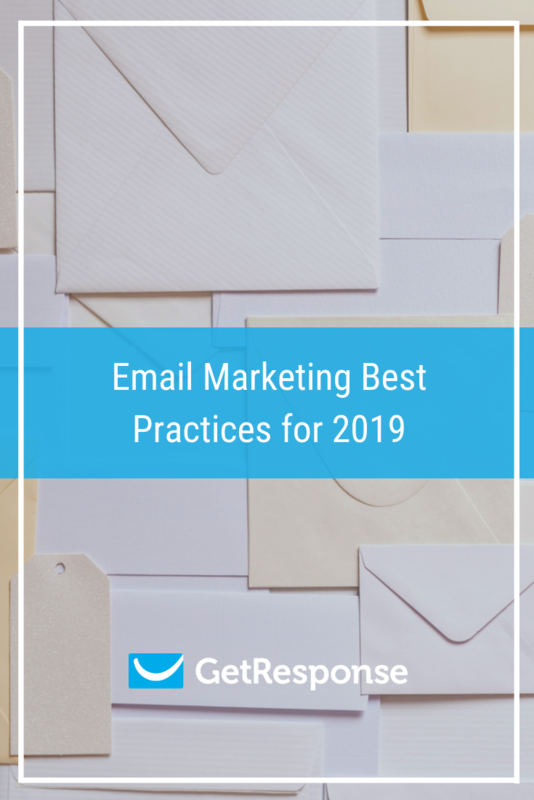 Read on and follow these 15 email marketing best practices that’ll get your campaigns going in 2019. We’ve blended the latest data, and our experience working with customers across industries, to bring you the top email marketing tips you can use to better optimize your campaigns. Check them out and choose the ones you haven’t tried in a while (or at all). Then, schedule A/B tests to see what works best for you. Of course, not all audiences are the same. Some of these tips will resonate better with your customers than others. The key to long-term success with your email campaigns (and any other marketing campaigns for that matter) is to keep observing, analyzing, and learning what works for you. The welcome email is the single most effective message you can send. According to our latest data, average open rates soar above 80% – and click-through rates are around 22-25%. Welcome emails also help keep your list clean and improve your deliverability. If someone enters the wrong email address, the welcome email will generate a hard bounce. That then notifies your email provider to remove it from your list. They also reassure your new email recipients that the signup worked, and the information they want is on its way. Plus, they help you connect with new subscribers. Offer something valuable or exclusive at the start of their journey and watch click-throughs rise. Looking for inspiration? 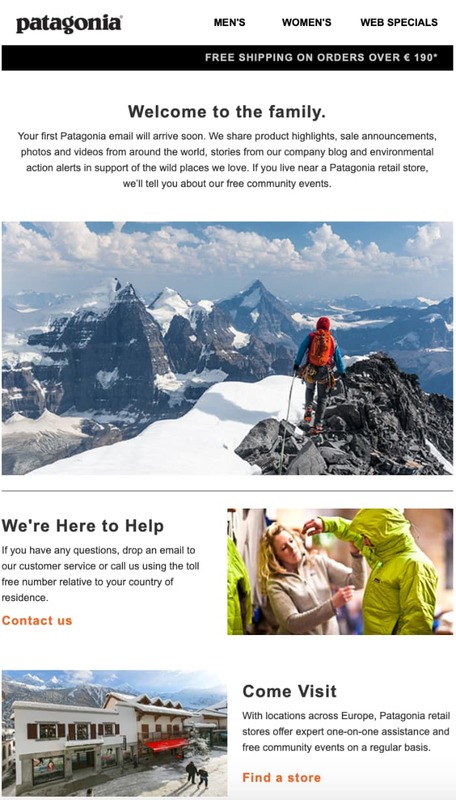 Check out these welcome email examples. Every email marketer wants their newsletter to be at the top of the inbox. After all, most subscribers will pick the emails they see first. So when should you send your emails? Let’s see what the data tells us. Two timeslots tend to get the best open and click-through rates: 9-11am and 3-5pm. And it’s been that way for at least the last two years. What’s the best time to send your email campaign? When it comes to picking the right day, it doesn’t seem to make a huge difference. As long as you stay away from the weekend, your engagement rates should be fine. What’s the best day to send your email campaigns? Having said that, you need to remember that these are aggregate global results that take into account every industry we’ve identified in our customer base. Chances are, your audience will respond to campaigns sent at a different time. It depends on your market, consumer trends, and your customers’ preferences. Want to step up your game? Use tools like Perfect Timing and our algorithm will pick the best time to send your messages. Another email marketing best practice is knowing how often you should contact your subscribers. And that can be a tricky task. If we look at the mailing frequency data, we see that email marketers who send just one newsletter a week get the highest average open and click-through rates. It’s a popular approach, since 49% of all accounts we analyzed only send one newsletter a week. Bear in mind this data doesn’t exclude marketers who also send triggered emails or RSS emails. Around 19.5% send two newsletters a week, and 9.32% send three. Just 5.5% and 3.93% send four and five emails respectively. How frequently should you send your newsletters? At the same time, since most marketers want to maximize their email campaign ROI, instead of average CTRs we should look at the total number of conversions they generate. Based on that assumption, you might be better off sending two or more emails in the same week. But to say for sure, we must take into account some other factors: extra revenue you’d make from sending an extra campaign, how many subscribers would leave your list after receiving too many messages, plus the cost to replace those leads. In fact, one study, conducted by Return Path in 2015, focused on the consquences of both undermailing and overmailing. 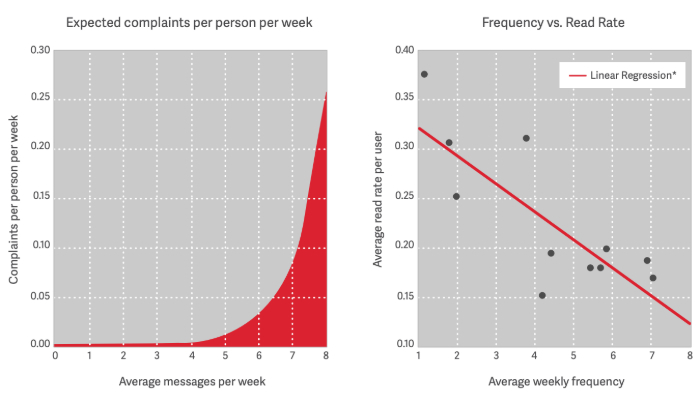 How mailing frequency affects the spam complaint rates. In short, undermailing leads to missed revenue opportunities, lower lifetime value, lack of inbox presence, poor or inconsistent sender reputation, inability to maintain a clean list and avoid spam traps, and counterintuitively – increased complaint rates. Overmailing, on the other hand, leads to decreased engagement, increased opt-outs, reduced visibility for all subscribers, and more total complaints. As for the most optimal mailing frequency, there wasn’t one clear winner. The primary email recipients (those who accounted for 83% of all email reads), were able to tolerate up to about five emails per week from a given sender before their complaint rates increased dramatically. If you ask me, that number is a bit extreme and I wouldn’t suggest that you go out and start sending your email campaigns five times per week. This all depends on your market and products. Divide your audience into two or more groups, and see if sending one extra email campaign boosts your results – both in the short and long term. In his article, Tim Watson dives deeper into how you can establish the right mailing frequency for your business. If you’re not interested in experimenting, you can also ask your audience to manage their own frequency, using an email preference center. Remember that while it’s easy to control how often you email, it’s often harder to see how many triggered emails are sent to your contacts each week – especially if they’re sent in response to an action. Email deliverability is crucial to your campaign success. 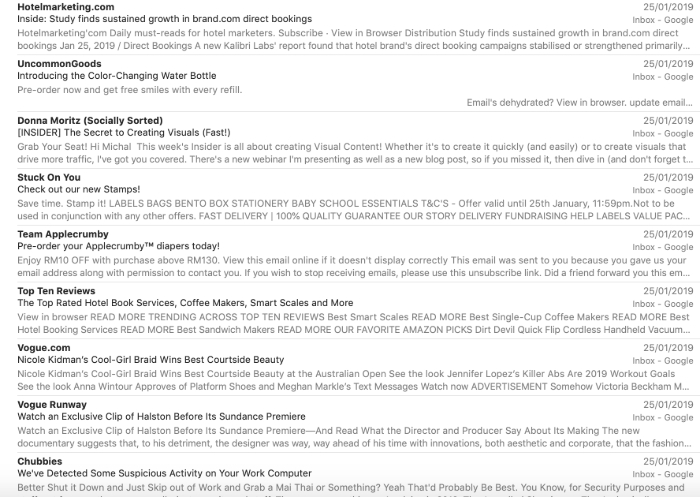 It doesn’t matter how interesting or beautiful your emails are. If subscribers never see them, they won’t convert. Many marketers think only their email service provider handles email deliverability. But it goes beyond that. Your email content, frequency, and list-building methods all impact your deliverability. 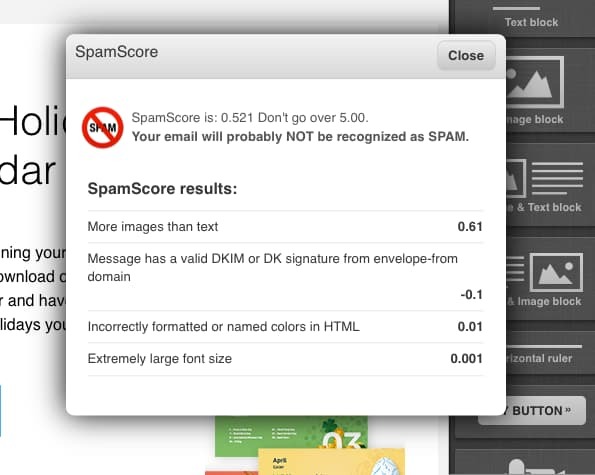 Example of an email spam score test result. – How email deliverability works and how to improve it. – How to measure and track email marketing metrics like bounce rates, complaint rates, and list churn rate. And in email marketing, it can also be the last one you make. If your email doesn’t stand out and build trust, your subscribers probably won’t bother opening it. And if they ignore your newsletters a few times, your future campaigns could go straight to junk. That’s why paying attention to your sender name is an email marketing best practice. Think of it as your brand name. Your customers should respond well to it. They’ll then check out the subject line and preheader – or open the email right away. First, your sender name should be recognizable and memorable. You also have to offer value. Always. This article has plenty of tips for that, so let’s focus on making your sender name identifiable. From name address examples from various brands. As far as we’re aware, no-one has ever studied which one works best. It seems to be a matter of preference – and what suits your brand voice guidelines. If you have a strong employee with a good personal brand who’s associated with a particular campaign, you could use the combination of [Employee Name] from [Brand Name]. But that might not work for B2B, when it’s more important for the communication to come from the brand itself. So take these ideas, compare them with your brand voice guidelines, and A/B test them. Then stick to the one that works. Over time, people will get used to seeing the same name. So if you change it later on, they might not immediately connect it with your brand. You also have to think about the sender address. Because it builds its own reputation over time – in the eyes of ISPs. Changing it too often can affect whether your recipient’s email provider accepts your emails. To avoid problems with your email deliverability, don’t change it too often, send from a company domain (not freemail like Gmail or Yahoo), and use a trustworthy address. 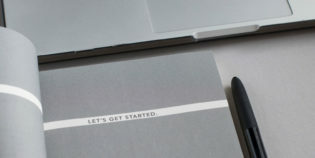 Funny From address in a newsletter from Huckberry. The noreply@ addresses is a little ironic. Most marketers will swear their customers are at the center of their business. That they care about their opinions and feedback, both positive and negative. I get it. The sheer volume of auto-reply and out of office messages can often be overwhelming. And sometimes your email doesn’t seem like something people will respond to. But your customers might see things differently. Don’t make it harder for them to give feedback. You probably have business profiles on Twitter, Facebook, and LinkedIn – all to be where your customers are. And to be available. It’s the same with email marketing. Who knows, maybe those who care enough to hit reply will be your best brand ambassadors. The benefits of ditching the noreply@ address outweigh the negatives. No-reply email address from Google+ announcing the closing of their platform. Studies show up to 50% of subscribers decide to open a message based on the subject line. Depending on their email client and your own settings, they might also see filters and labels. But given that the subject line is much longer than the sender name and preheader, it plays a big part in the action subscribers take. So how do you write effective email titles? First of all, take time to craft them. Treat them as the most important element of your email campaign – which they are. Don’t leave it as an afterthought. Set aside time to A/B test your subject lines. And use data, not your gut feeling. And try personalization and emojis. Both have shown to have a positive effect on average email open rates. Open and click-through rate vs the email subject line length. Pull all the aces out of your copywriting sleeves. Use power words, questions, idioms, and other tactics that may move the needle for you. And always remember who you’re contacting. What devices do they use to open your emails? When and where do they click on them? And what are they interested in? Whenever we talk about email marketing best practices, we always say email list quality beats quantity. But we meet many marketers who are scared to use confirmed opt-in. Q: But won’t it make my list smaller? Q: Won’t people be angry having to click the link to get my emails? Q: So why on Earth would you suggest using confirmed opt-in? A: Because the benefits outweigh the costs. At least that’s what our data suggests. When you compare the average email marketing results by industry with the use of double opt-in by industry data, you can see a link. Industries that use confirmed opt-in more often usually outperform those who don’t. The same goes for places with stricter laws, like Germany or Europe in general. They outperform the locations where marketers don’t have to pay the same amount of attention to who joins their email list – and how. This article outlines why it’s worth using double opt-in. Why not give it a go? At the very least, it will positively affect your deliverability – which is still a big win. Clear instructions regarding the confirmation email presented on a thank-you page. With more competition, building an email list isn’t as easy as it once was. And that’s despite the fact that we know at least 43 effective ways to build an email list. It’s not only challenging because your audience has far more information sources to choose from. It’s also because some marketers have abused the privilege of getting into their subscribers’ inbox. They’ve sent too many irrelevant, uninteresting, or (worse) misleading email campaigns. That means website visitors might think twice before filling out a form. And, they’ll expect far more value in return for their email address. It’s hard to prove your newsletter is worth it in a simple web form. But a lead magnet can be a great way to offer value upfront. Lead magnets – also known as incentives, freebies, or ‘bribes’ – are the best way to overcome people’s hesitation. It can be a downloadable ebook, special industry report, calendar, or another enticing giveaway. Here are some more lead magnet ideas to inspire you. Since there are so many to choose from, you’ll need to test them to see which one gets the biggest conversion rate. It’s a low-cost freebie, especially as there’s no guarantee to win. But the value of winning is relatively high if you look at it from an individual user’s perspective. What’s also interesting is these books probably don’t relate to the newsletter content. But they allow the business to position itself as an industry authority. And that’s a pretty smart marketing move. What’s so special about emails you consider click-worthy? If you look at your favorite newsletters, you’ll probably find some common threads. They either offer great products, interesting stories, thought-provoking articles, funny videos, or something else. Nothing comes to your mind? 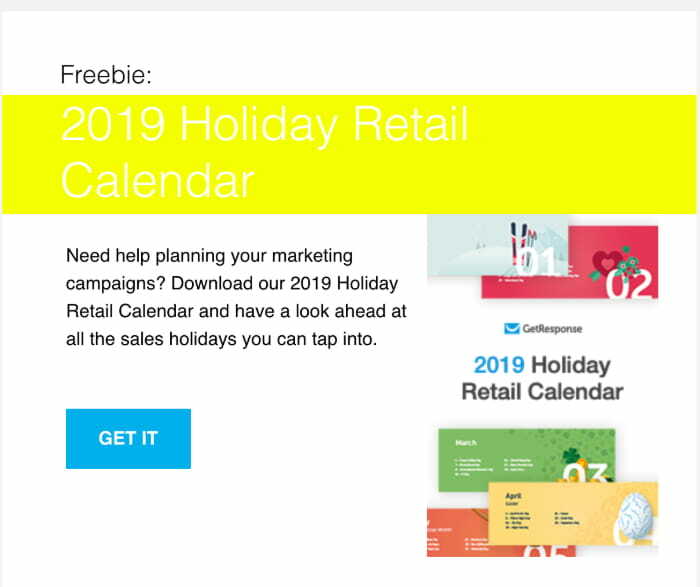 Here are some great email marketing campaign examples. Me? I like text-based emails with a single call to action that takes me to the full version of the article, or a video tutorial. Ask your subscribers the same, and you’ll likely get a bunch of different answers. But what are some common features? Our data suggests emails with video observe click-through rates of up to 8%. Emails with images perform better than those without. There’s over one percentage point difference in click-through rates (4.11% vs 2.87%). So, you need to analyze your email campaigns and see what worked well in the past. If you haven’t tried videos, animated gifs, interactive content, personalization, or emojis, it might be time to give them a go. It’s a cliché, but you have to get creative. 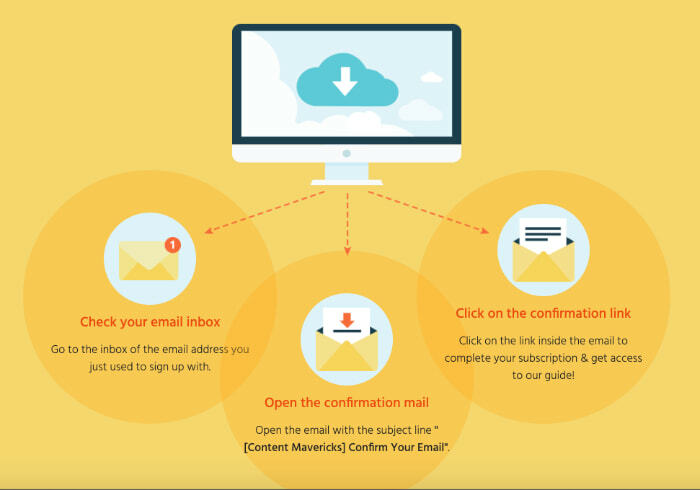 Take this example of how to use interactive content in email campaigns from Email Monks. Interactive email newsletter for Valentine’s Day. “Don’t make mistakes.” That would be a very unhelpful email marketing tip! So instead, let’s say you should test and preview your emails before each send. We’ve all seen emails with broken subject lines, images, or inaccurate personalization. The ones that call you Emma when your name is Bob. The ones that say you’d look great in a dress, when you prefer cargo shorts. Or the ones that are so broken, you don’t know where to look. But all of these mistakes can be avoided. Take the time to preview your emails in popular email clients, make sure they won’t land in the junk folder, and send the message to yourself – before it reaches your entire list. 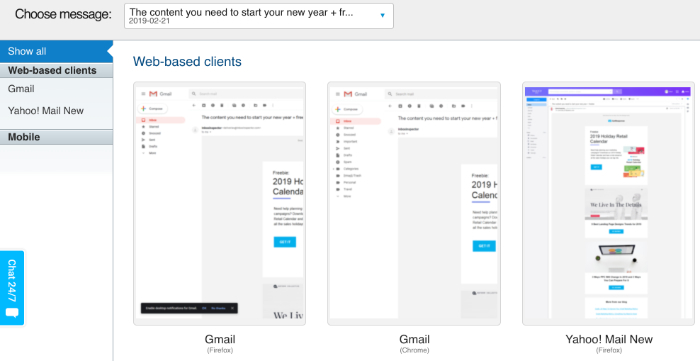 Preview what your emails will look like in different web browsers and email clients. It pays to double-check your emails for silly mistakes. Of course, you might mess up on purpose as a stunt or joke. Just make sure it’s a good one – and don’t do it too often! It’s easy to forget you have a diverse audience. Serving them goes beyond simple segmentation and personalization. You also want to make sure your marketing messages are accessible. According to World Health Organization, over 1.3 billion people live with some form of visual impairment. Odds are, some of your subscribers do too. There are ways to make your emails easier for them to access. First, add ALT text to your images. People using a screen reader can then understand the content better. Top tip: Add a period after the image text. The screen reader will then pause, so it’s easier to understand your email. You can also check the image contrast ratio to improve readability. This is what bad color contrast would look like in an email campaign. The headline is almost impossible to read. Check out this article from Email on Acid for more ways to make your emails accessible. What do you want to achieve with your email marketing campaigns? Is it more opens or conversions? How about more revenue per email sent? You need to set the right objectives. 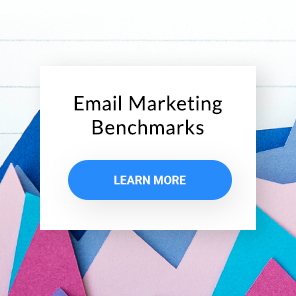 And if you’re reading these email marketing best practices to improve your results – you should look at the right email KPIs. The email open rate is often considered a vanity metric. The click-through rate is more actionable, but it still doesn’t tell you how much revenue your campaigns generate. So it’s best to learn about all the key email marketing metricks and how to choose them to suit your objectives. Do you remember we said the sender name, subject line, and the preheader are the first things subscribers see? Even if half your subscribers open your message on the subject line alone, the rest are swayed by other things. While they’ll likely see the sender name first, the preheader still plays a part. This is especially the case for email campaigns with shorter subject lines, since the preheader will take up more space. The preheader can enhance your email subject line and increase your open rates. In fact, our data shows messages with preheaders have average open rates of around 29%. That’s almost 7 percentage points more than emails without preheaders. Yet surprisingly, only 11% of messages have one. See how the preheaders add more information to sway someone to open up? So, pay attention to your preheader. Want to learn more? Here are two articles on the do’s and don’ts of the email preheader text. Finally, to be successful in email marketing, your subscribers must take action. But sometimes you need to give them a little push. When designing your emails, make sure recipients know what to do next. Is it register for a webinar? Download an ebook? Or maybe share your story with their network? Whatever it is, ask for it! To do that, you’ll need calls to action (CTA). These can be buttons or simple text. It’s best if you test them. The fewer calls to action, the more attention they’ll get. Their design and placement also matter. Keep them visible and easily accessible – especially on smaller devices like mobile phones. To make your calls to action more powerful, play around with the copy and elements around them. For example, you could add a countdown timer or mention when the offer expires. Or add a testimonial for credibility. 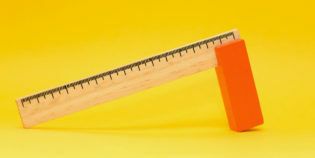 The good news is, there are many more ways to increase your click-through rate. Creative call to action copy in a newsletter from Casper. 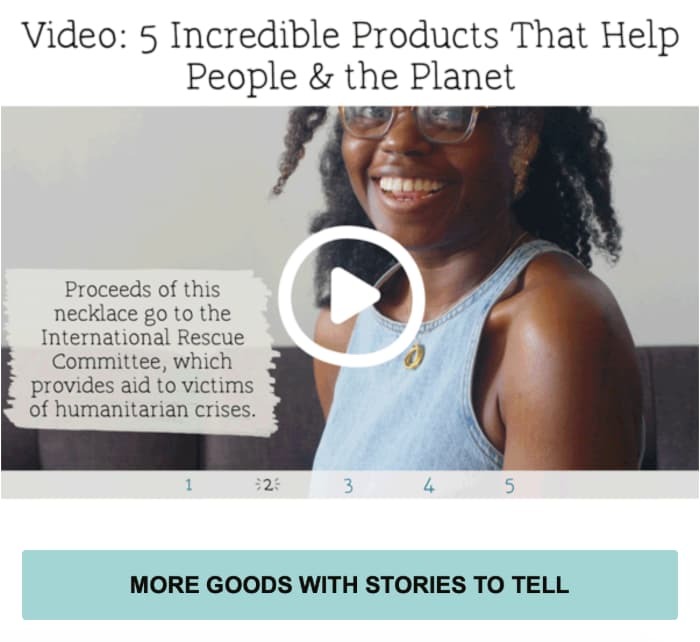 Descriptive call to action button copy from Uncommon Goods. Example of an original email CTA button. You now know all 15 email marketing best practices. So what will you focus on first? And keep an eye on this article. We’ll keep it updated with more actionable tips on how you can improve your email marketing strategy. You can bookmark it, or sign up to our newsletter to be first to know.